Greetings loyal readers and friends of Built from Ink and Tea! Where have we been? I am certain you have noticed the lack of posts, lately. This is due to the fact that we are moving! The Built from Ink and Tea offices are being relocated. During this time, we have been doing a lot of thinking and planning for our future, and we are excited to bring you new content, starting in April. Thank you for staying with us. We look forward to getting into writing again and continuing to bring you the best of tea, teaware, writing instruments, and more! 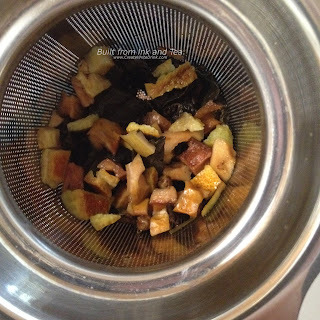 Today's tea review leaves the world of tea bags and loose leaf infusers, instead delving into an entirely different style of tea-making: the single-serving capsule. While Keurig machines have had tea options available for quite some time (including the "fill your own" style, which can be used with tea), other capsule-using intended-for-coffee machines have not had the same treatment...until now. I have been following Gourmesso and their offerings for some time. They make espresso capsules that are compatible with the Nespresso Original Line machines, offering them at a cost lower than the official Nespresso capsules and with a quality that is a good value. 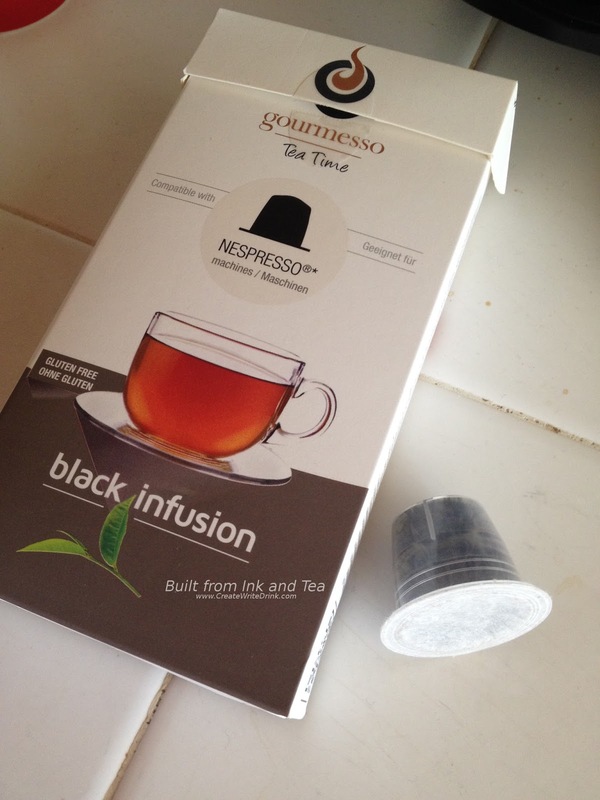 Recently, Gourmesso began offering tea capsules, allowing owners of Nespresso machines to brew tea with their machine. And why not? The machines effectively take hot water and pass it over the contents of the capsule to make the drink. 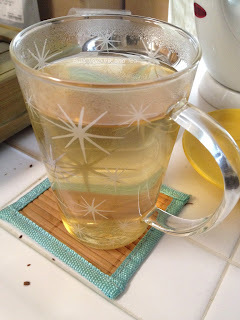 Now, this certainly does differ from the standard tea steeping in which the tea sits in the water and then is removed, but with enough tea leaves in the capsule along with enough space for the water to move between them the results are good! These capsules are meant to be used with your machine's lungo setting. It is highly advisable that you run the lungo setting without a capsule, first, to clear any coffee residue from the machine. Subsequently, I brewed a capsule of Black Infusion into my cup, providing me with a nice half-cup of tea. Gourmesso provides no information on the actual tea within their capsules, but to me it smells young and brisk, a plain-tasting black tea. With some milk and sugar, one might still maintain good results in this cup. However, for a tea drinker, there are many better options. This cup is drinkable, better than most bagged tea I have tasted, but nowhere near the top of my buy list. I believe that Gourmesso is using their new tea capsules to target an espresso-only drinking audience, who may want tea on hand for the rare cuppa, for guests, or for recipes that call for tea. This has been a pioneering effort on their part, and I hope that it will drive more espresso drinkers to give tea a try. Gourmesso's Black Infusion is available from their website, here. Welcome to March! As summer approaches, I find myself looking back toward winter (which was unseasonably warm in my part of the world). Released in the Winter 2015 collection, DavidsTea's Mulled Wine pays tribute to a classic alcohol beverage without the alcohol content or taste. Ideal for a winter evening or morning (or any cool time of day! ), Mulled Wine brings spices and citrus together in a combination of savory flavors. Using the recommended amounts of tea blend and steep time, I steeped two teaspoons of Mulled Wine in twelve ounces of water for five minutes. The water had been heated to boiling and then allowed to cool for a few minutes - ideal for an oolong, whose leaves do no need just-boiled temperature water but can withstand more heat than those of a green tea. 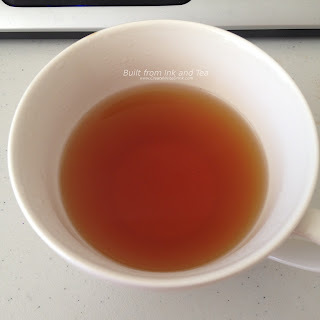 It often interests me to see how many of the advertised ingredients can be identified in the smell of the dry tea blend versus in the prepared tea itself. 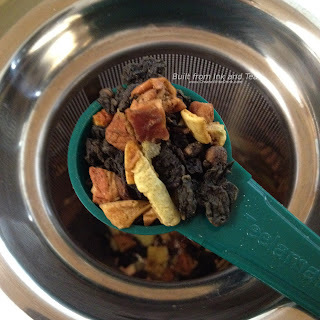 Here, the orange peel is the most prominent ingredient in the dry tea blend, along with cinnamon, clove, and apple. I feel as though the ginger might be there, but the smell is very faint. 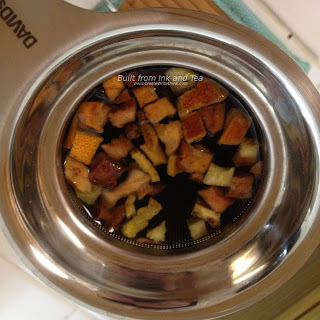 Overall, the aroma reminds me of the orange slice gummy candy, covered in sugar. It smells very sweet. In other tea blends that I have tried, apple is often added to naturally enhance the sweetness of the blend. Once the cup has been brewed and prepared (and cooled enough to drink), I sniff and sip. The aroma of the cup is a lot darker than that of the dry tea blend. 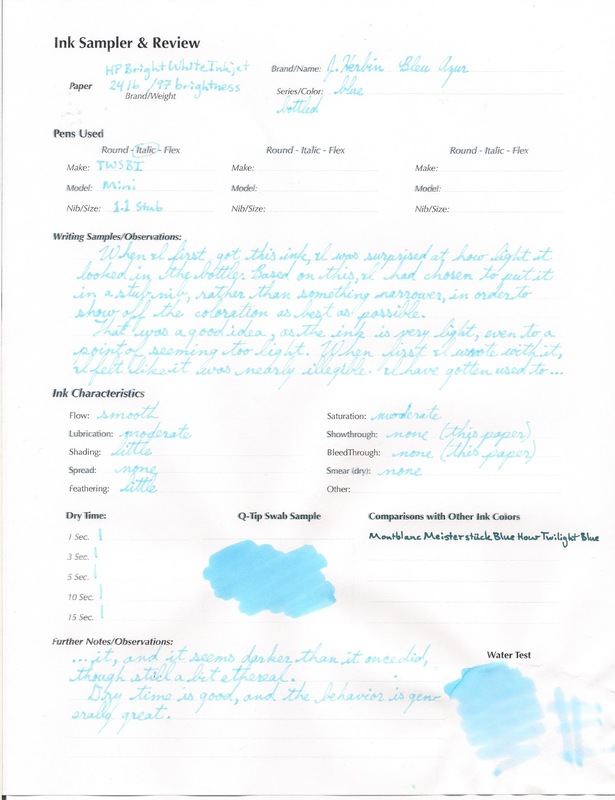 I think this is on account of the oolong, though the citrus and spices are much more prominent now, too. The sweetness of the aroma has diminished, some, and the citrus seems more balanced with the spices. The citrus smell may actually be a bit more subdued, now, and not as sharp. The flavors are delectable and not overwhelming, as I feared they might be (based on the dry leaf aroma). There is a bit of sweetness, but not too much. In fact, the sweetness goes quite nicely with the citrus and spice. Speaking of spices, the cloves and cinnamon have infused the cup with spicy warmth. The aftertaste holds a slight bite, which I believe is from the cloves and ginger. Overall, my cup of DavidsTea's Mulled Wine tasted delicious, smelled amazing, and provided a warming and very pleasant experience. On my personal enjoyment scale, I would rate DavidsTea's Mulled Wine a 93/100. DavidsTea's Mulled Wine is available from their website, here.